Security theater is what happens when there is a disconnect between how we feel about our own security, and what the actual security measures accomplish. 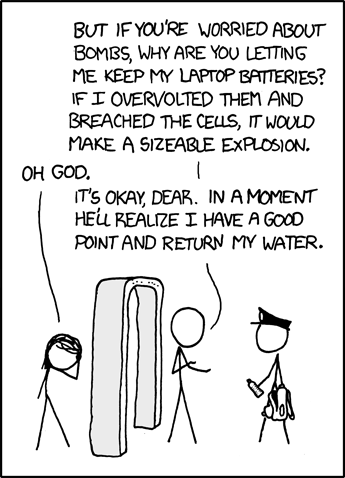 While the cases in which security theater leads to waste are numerous (e.g., TSA) there are some cases in which it is actually helpful. For example, Schneier pointed out that after the Chicago Tylenol murders, tamper-evident safety-seals were introduced to help make people feel safer. Yet, those seals are not truly effective against stopping a determined attacker. Nonetheless, since the actual risk of death is low (i.e., the murders were a fluke), using such seals brings our feelings of security in line with the reality. One of the reasons that it's so hard to get rid of security theater stems from the asymmetric rewards that policy makers have: by making people feel safer, a policy maker is shielded from accusations that they didn't do everything possible to prevent the attack. Since there is no way to prevent all attacks, the measures continue to increase in response to every attempted attack in order to further avoid blame. Schneier claims that the only way to break the cycle is for the population to refuse to be terrorized. Security Theater at Wikipedia for examples. Beyond Security Theater at Schneier on Security for an explanation of movie-plots.